We present a unifying framework for generating extended formulations for the polyhedral outer approximations used in algorithms for mixed-integer convex programming (MICP). Extended formulations lead to fewer iterations of outer approximation algorithms and generally faster solution times. First, we observe that all MICP instances from the MINLPLIB2 benchmark library are conic representable with standard symmetric and nonsymmetric cones. Conic reformulations are shown to be effective extended formulations themselves because they encode separability structure. 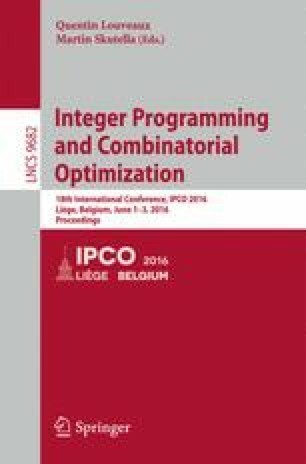 For mixed-integer conic-representable problems, we provide the first outer approximation algorithm with finite-time convergence guarantees, opening a path for the use of conic solvers for continuous relaxations. We then connect the popular modeling framework of disciplined convex programming (DCP) to the existence of extended formulations independent of conic representability. We present evidence that our approach can yield significant gains in practice, with the solution of a number of open instances from the MINLPLIB2 benchmark library. We thank the anonymous referees for their comments. They greatly improved the clarity of the manuscript. We also thank one of the anonymous referees for pointing out the SOC-representability of the sssd family of instances originally derived in . M. Lubin was supported by the DOE Computational Science Graduate Fellowship, which is provided under grant number DE-FG02-97ER25308. The work at LANL was funded by the Center for Nonlinear Studies (CNLS) and was carried out under the auspices of the NNSA of the U.S. DOE at LANL under Contract No. DE-AC52-06NA25396. J.P. Vielma was funded by NSF grant CMMI-1351619.